Alpha Bible Study meets in the homes of our members for fellowship, prayer and study. They meet in the evenings on the 2nd and 4th Mondays of the month. Call the church office for more information. 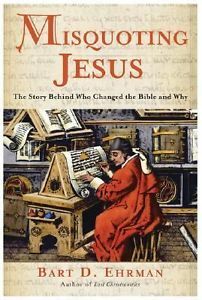 In 2015, the group had a study on the book Misquoting Jesus: The Story Behind Who Changed the Bible and Why by Bart D. Ehrman. The book rescues Jesus’s words and ideas from much of what religion has done to them throughout the ages. For almost 1,500 years, the New Testament manuscripts were copied by hand––and mistakes and intentional changes abound in the competing manuscript versions. Religious and biblical scholar Bart Ehrman makes the provocative case that many of our widely held beliefs concerning the divinity of Jesus, the Trinity, and the divine origins of the Bible itself are the results of both intentional and accidental alterations by scribes. In this compelling and fascinating book, Ehrman shows where and why changes were made in our earliest surviving manuscripts, explaining for the first time how the many variations of our cherished biblical stories came to be, and why only certain versions of the stories qualify for publication in the Bibles we read today. Ehrman frames his account with personal reflections on how his study of the Greek manuscripts made him abandon his once ultra–conservative views of the Bible.